Marble has some of the most beautiful designs in the world. You do not have to travel to realize that this is one of the most preferred stones when it comes to kitchen countertops. Its partner in crime is mainly granite. The two stones have served us as countertops for more than a few years. The se stones have been in the business for more than a century. We can therefore say that they have proven to be the best over the years. Tried and tested the two stones come with a variety of advantages. The white color of marble and the lovely patterns found on it have made it a favorite among décor enthusiasts. Its consistency is what keeps people coming back. You just cannot reproduce the beauty of the stone as it is made in nature. The stone is also durable. With proper care you can have your marble countertop for many years. Even if you are using in a harsh environment or one that is in constant use such as the kitchen you will be happy to know it can survive the heavy usage. Heat is not a limiting factor for the marble countertop. The stone itself is created via heat so you can go ahead and place a hot skillet right from the fire on it and not have to worry about leaving a dent in the countertop. Marble is also very hard and heavy. This means that you are assured of a sturdy countertop that will not suffered mage or crack. The marble stone is sought of an oxymoron as it can be easily scratched. You should get used to chopping boards when working with this countertop. Granite on the other hand does not suffer this fate you can chop veggies right on it. Taking proper care of your counter will lead to the reward of durability. These two stones can last you years if well taken care off. The trick with natural stones is to find the best contractor. USA Marble and Granite Company offer the best services. The sell and install marble and granite countertops. You can get a really good slab of stone and then have to give it up for the installation and get it ruined. This is the worst part because if you have the stone ruined during installation you cannot recover it. 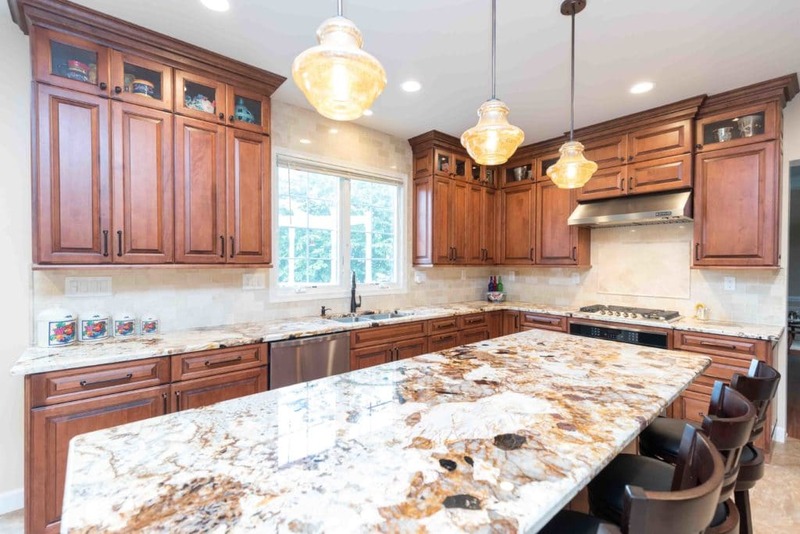 Both marble and granite countertops are good options for your bar or kitchen. They are durable and have the glossy finish that comes with all natural stones. The patterns and color options over at USA Marble and Granite Company are endless. The company will have patterns ready to choose from the most basic to exquisite designs that you just cannot have duplicated via manmade stone. Natural stones also do not have to come with binding. The specs of shine in the stone are made naturally and do not have to be bound by a polymer to avoid harming the user.